A Crafty Gals Life : Check Out The Challenge! Time for a new ATG (Anything Goes) Challenge! 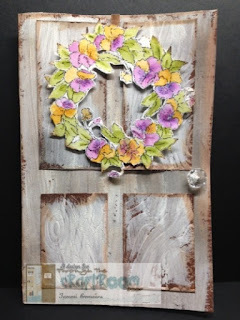 I have colored the Pansy Wreath with a twist of mixed media for the door. I had a blast making this card. The supply list will be provided in the next issue of TTCRD Magazine. Tammi, what a cute card! I love the door concept with the wreath!